Laura Nave grew up in Kingsville TX, where her parents own and run a sawmill and woodworking business. She has traveled to parts of Europe, North and South America. Her travels inform the designs of her work and research in the history of craft and the decorative arts. 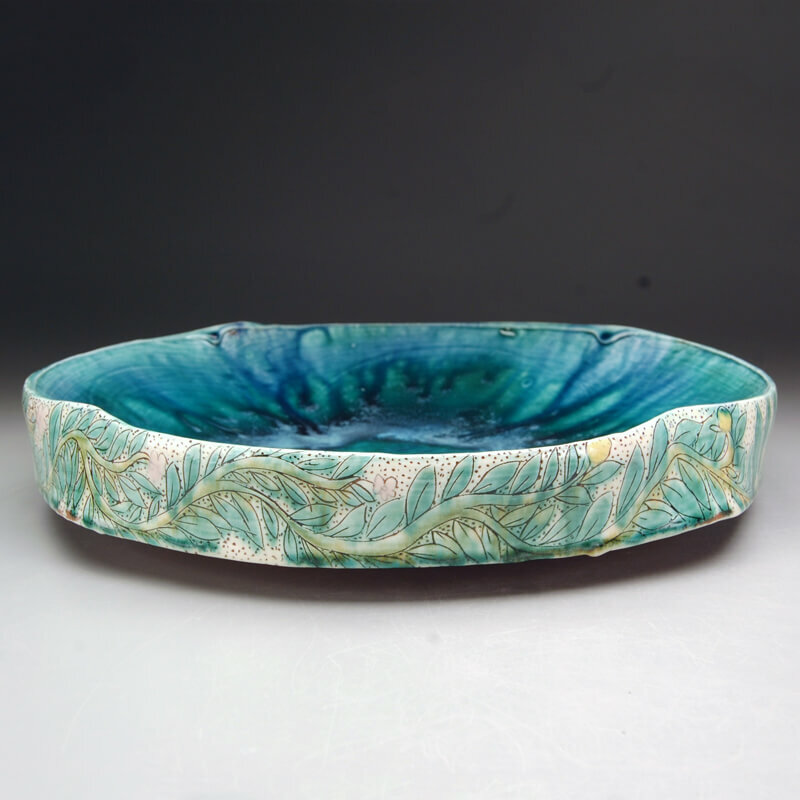 Laura received her BFA in ceramics from University of North Texas in May 2014, and continued there doing post-baccalaureate work until May 2015. She is currently pursuing her MFA degree at Wichita State University with plans to graduate May 2018. In my pots there is an ebb and flow between two or more points in a spectrum; full – empty, beginning – end, life – death, rough – smooth, absence – abundance, day – night. I explore these dualities by making decorated functional pottery. My fresh touch in clay through throwing, pinching and drawing allude to change that has then been frozen and made permanent. I contrast open areas with dense patterns that grow and move across simple yet full forms to spark the desire for intimate investigation. I work within themes of cyclical and linear perceptions of time. My forms and patterns are inspired by markers of growth and time passing, vegetation and animals, such as plants growing, bees pollinating, geese migrating, seasons changing, and ideas of life and death. My pots convey a sense of generosity and abundance even when at rest, as if they were a well wishing letter to the user. With these decorated functional pots for the everyday and celebrations, I strive to understand and balance the complexities of cyclical and linear perceptions of time.